In this series of guides we’ll be using the free and open source desktop platform, QGIS to prepare our data / maps for publishing. Before we start, we’ll first setup QGIS. Ensure you have the latest LTR (long-term release) of QGIS (2.18.x at the time of writing). You can download QGIS from here if not. Ensure you have this information handy. Mappin stores its published vector data (e.g. polygon data) in an internal PostGIS database. We will now configure a connection to this database in QGIS. This connection will be used in QGIS to upload data for publishing. 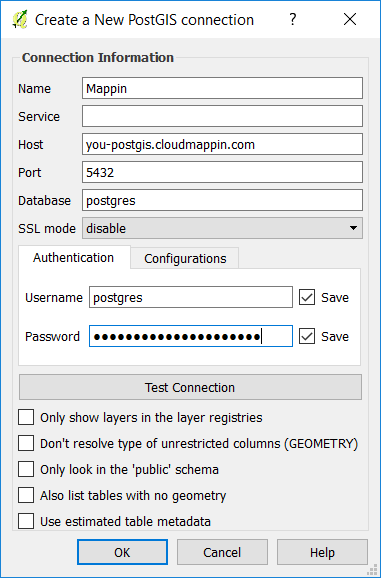 A PostGIS connection to Mappin has now been configured in QGIS. Mappin provides a tile-based WMTS (Web Map Tile Service) which provides national background mapping. We will make use of this service to provide contextual mapping to our published data. Let’s configure the WMTS connection in QGIS. 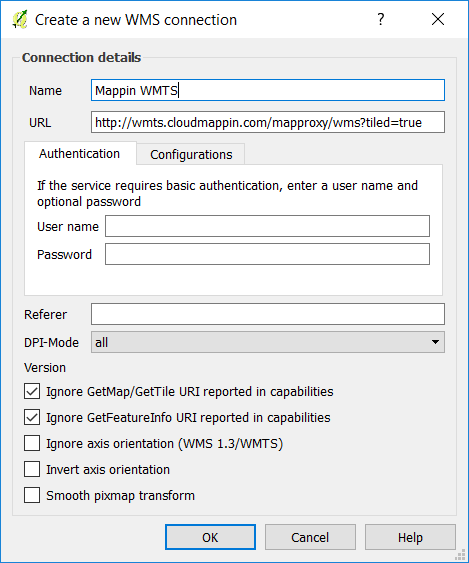 Mappin’s WMTS service has now been configured in QGIS. With QGIS now configured properly, we can now publish our first map.